Let’s assume for a moment that you accept our contention (Taylor et al. 2009) that, since extant terrestrial tetrapods habitually hold their necks in maximal extension, sauropods did the same. That still leaves the question of why we have the neck of our Diplodocus reconstruction at a steep 45-degree angle rather than the very gentle elevation that Stevens and Parrish’s (1999) DinoMorph project permits. As you’ll see, not only does the neutral pose show the characteristic subhorizontal neck with the drooping end, but even the maximally extended pose barely gets the head above the level of the back. In the most recent version of his Diplodocus model, Kent has slightly changed the angle at which the neck leaves the torso, due to a reconfiguration of the pectoral girdle, but this still leaves the neck very low. Diplodocus carnegii head, neck and anterior torso, right lateral view, articulated in habitual posture as hypothesised by Taylor et al. (2009). 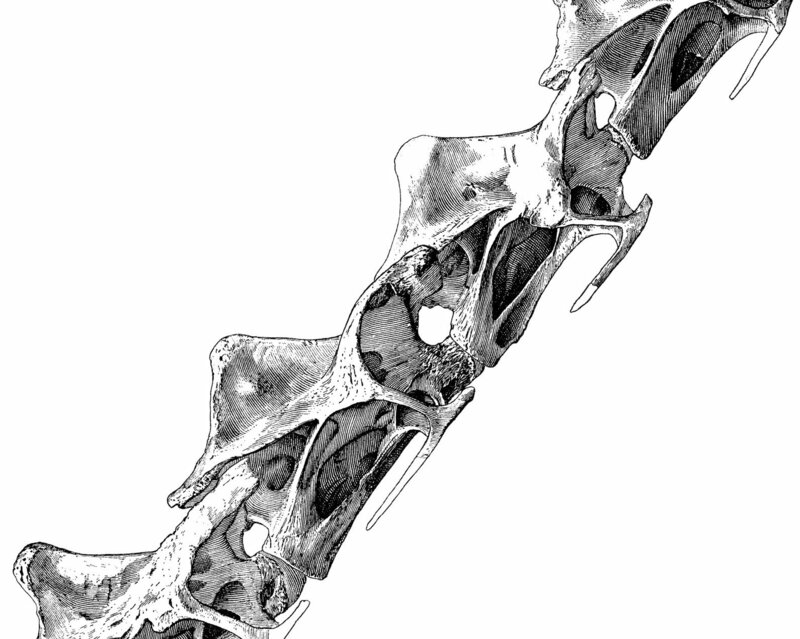 Skull and vertebrae from Hatcher (1901). Doesn’t the DinoMorph model show that the posterior cervicals just can’t do this? Check out that huge gap between the centra of the fourth and fifth cervicals! There’s no way to avoid this without putting a comically extreme downward kink in the neck at this point. And there are similar gaps at other points along the neck, including some near the neck-base that would require a strong upward kink in order to articulate both the centra and the zygapophyses simultaneously. Are we saying that in life, this specimen did have strong kinks in the neck? No, we’re not (despite the pleasant coincidence that this would force the neck into an extreme version of the elevated pose we’re advocating). What we’re saying is that sauropod cervicals are rarely — I’d go so far as to say never — preserved undistorted, and so you just can’t rely on how they seem to articulate, at least not for quantitative analyses. This post-mortem distortion should not be too surprising: unlike femora and other such solid bones, remember that the cervicals were highly pneumatic and composed primarily of laminae, which would be subject to all sorts of taphonomic and diagenetic distortion. In the extreme case of Sauroposeidon, the cervicals, which were up to 140 cm in length, “are of extremely light construction, with the outer layer of bone ranging in thickness from less than 1 mm (literally paper-thin) to approximately 3 mm” (Wedel et al. 2000:110-111) — it’s astonishing that they are not much more smushed up than they are. A second difficulty with Stevens and Parrish’s analysis is that their data for Apatosaurus was derived from a single specimen in the Carnegie Museum (CM 3018). This generally well preserved specimen has suffered severe damage at the base of the neck, and the three most posterior cervicals are thus represented by plaster models that cannot provide reliable anatomical data (Gilmore 1936, pers. obs.). Although Stevens and Parrish acknowledge that the morphology of the posterior cervicals is particularly influential in determining the nature of the feeding envelope, they do not mention this problem, and it is not clear how this gap in the data was addressed in their analyses. This deficit could have had a profound impact on Stevens and Parrish’s conclusions. And Gilmore’s observations are really rather damning: as well as the account of the damaged neck-base, he also noted (p. 195) that “the type of A. louisae [i.e. 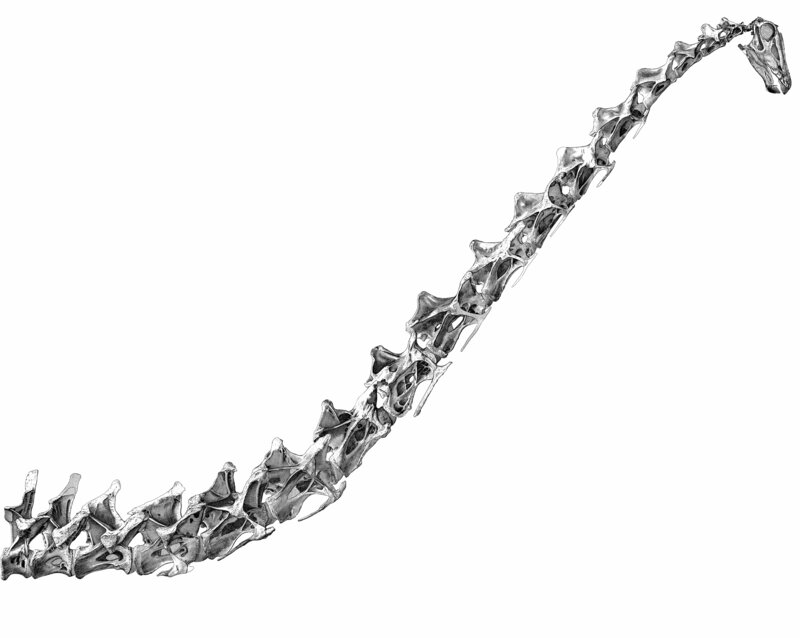 CM 3018] lacks most of the spine tops, only those of cervicals eight, ten and twelve being complete”. (You would never guess this from Gilmore’s Plate XXIV, which shows all of the cervicals but C5 essentially complete.) So all in all, the DinoMorph study’s Apatosaurus is not one I’d want to build an argument on. You’ll see that, while the condyles are sat nicely in the cotyles, the zygapophyses are not at all well articulated: in particular, the C7-C8 and C8-C9 junctions have the prezygs shoved much too far forward, so that a double downward kink would be necessary to accomodate these articulations without pulling the condyles out of the cotyles. Finally, while Matt and I were in Berlin last November, as part of the excursion associated with the awesome all-sauropod-gigantism-all-the-time workshop, we got to play with the superbly preserved set of anterior brachiosaur cervicals HMN SI, and we tried to articulate the real bones. We had to stop for fear of breaking them, because they simply would not fit nicely together. I’ve gone on much longer than I intended to in what was supposed to be a quick-and-easy post, so I’ll leave it here. In order to keep the recent paper short and snappy, we didn’t go into this in much detail, summarising down to a mere 88 words (Taylor et al 2009: 216-217), so maybe this will bear repeating (in more rigorous form) in a future publication. Martin, J. 1987. 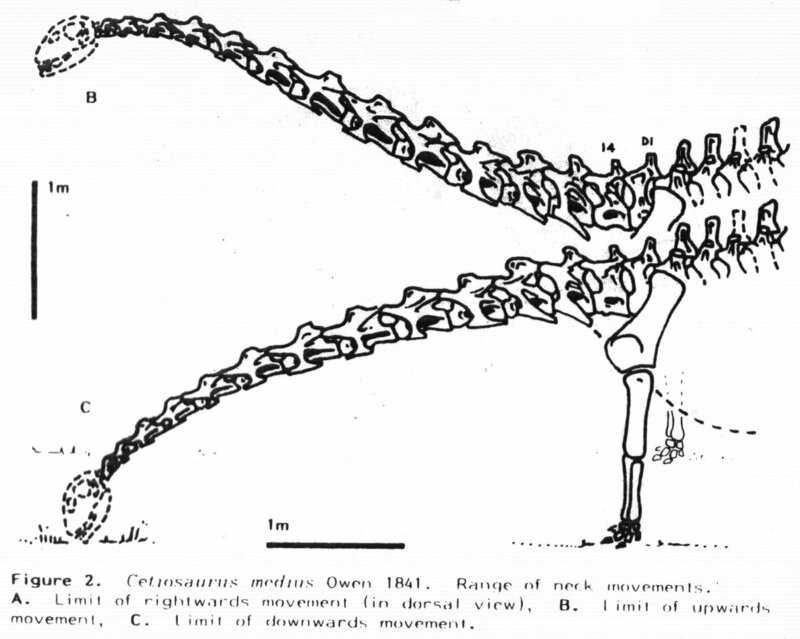 Mobility and feeding of Cetiosaurus (Saurischia, Sauropoda) ­ why the long neck? In: P.J. Currie and E.H. Koster (eds. ), Fourth Symposium on Mesozoic Terrestrial Ecosystems, Short Papers, 154­-159. Box-tree Books, Drumheller, Alberta. Wedel, M.J., Cifelli, R.L. and Sanders, R.K. 2000. Sauroposeidon proteles, a new sauropod from the Early Cretaceous of Oklahoma. Journal of Vertebrate Paleontology 20, 109-114. Lay off the poor old Rutland Dinosaur! Don’t dismiss the actual material too readily out of hand. In places the preservation is excellent, in others less so admittedly, but it’s not that distorted. I’ll grant you that the base of the neck is not properly articulated, and that has bugged me for quite a while. Unfortunately the last few cericals and first dorsals are missing their centra through(probably pre-burial)erosion, so the morphology is always going to be a bit uncertain around here. As for that strange kink in the neck at C4/C5, well…that’s most likely because when it was last mounted 15 years ago they realised they would have to raise the front of the neck a bit to make sure that the skull was high enough to be out of arm’s reach. Unfortunately museum mounts end up being a bit of a compromise. So, why haven’t we changed it? Well, for most of the last 10 years the galleries have been in a perpetual state of almost about to be redisplayed, so the chance to change things has always been just in the future. However, now it is being reveamped, and the skeleton will be coming down next year before it’s remounted. I suggest that this would make an excellent opportunity for anybody that would actually like to study the original fossil material to come and have a look. After all you’ve got to start with the specimens, which is what John Martin did. Crushed vertebrae…. the bane of dinosaur restoration! I’m guessing Hatcher probably left some field notes about the position of the Diplodocus cervicals. Though if they’re this hard to articulate, maybe they weren’t found in an articulated position, so the notes may not actually be that useful. Then there’s the whole “death pose” argument, and I’m not certain this worked the same way for sauropods as for theropods. I’m curious, what do you guys think of that? Sadly I’ve noticed other museum sauropod skeletons with gaps between neck vertebrae (or sometimes just painted plaster). The real bones are too crushed to fit, and casts are not “re-sculpted” (I assume because it’s either too expensive or for fear of inventing false details). But are there any good sauropod cervical columns without crushing? What’s the case with Euhelopus? In the Wiman engraving, the neck didn’t appear all that crushed. We love the old Rutland Dinosaur! And the museum it’s housed in, and the people who work there. Seriously, we’ve been treated exceptionally well by curators and collections managers just about everywhere we’ve been, but the let’s-drop-everything-and-help-the-scientists-on-zero-notice hospitality we received at Leicester is still second to none. Don’t dismiss the actual material too readily out of hand. …that means that however nice the rest of the material is, it’s pointless to try and reconstruct the posture at the base of the neck in that individual. However, now it is being reveamped, and the skeleton will be coming down next year before it’s remounted. I suggest that this would make an excellent opportunity for anybody that would actually like to study the original fossil material to come and have a look. That is good news, and a great opportunity. Hopefully the HMS SV-POW! will be able to send an away team. After all you’ve got to start with the specimens, which is what John Martin did. All is not lost at the base of the neck; lab sketches of the material during prep show that the zygs of those vertebrae (C13-D2) were articulated in extension. Possibly this was a death pose, but it should provide some information on the likely dimensions of the missing centra. I’ve done a new Vidal-compliant reconstruction incorporating this, but as our site is down at the moment, I can’t post the link – later. Mark, it’ll be great to look at that material properly when it’s down from the mount. Believe me, I will be there! It wasn’t my intention to downplay the quality of the specimen — it is, hands down, the best British sauropod specimen, nothing else that’s been published even comes close. My point was only that it’s not suitable for quantitatively assessing neck posture or range of motion — and neither is any other sauropod specimen. I just checked back on what Hatcher (1901) has to say about the preservation of the neck of CM 84 (the Diplodocus carnegii holotype that is used in the DinoMorph model) — and there it is, page 4, second paragraph: “[The] vertebrae are for the most part fairly complete, though unfortunately the sacrals and anterior cervicals are more or less injured“. And on page 10, “the different vertebrae did not lie in such relative positions as to make it certain that none were missing from the series.” And on pages 20-21: “Cervcials Three, Four, and Five.–All of these vertebrae are more or less injured. The neural spines and transverse processes especially are not well preserved” (although “the centra, neural arches and zygapophyses are for the most part complete”). See? You can’t trust anything. Not even the best preserved sauropod in the world. yikes…. 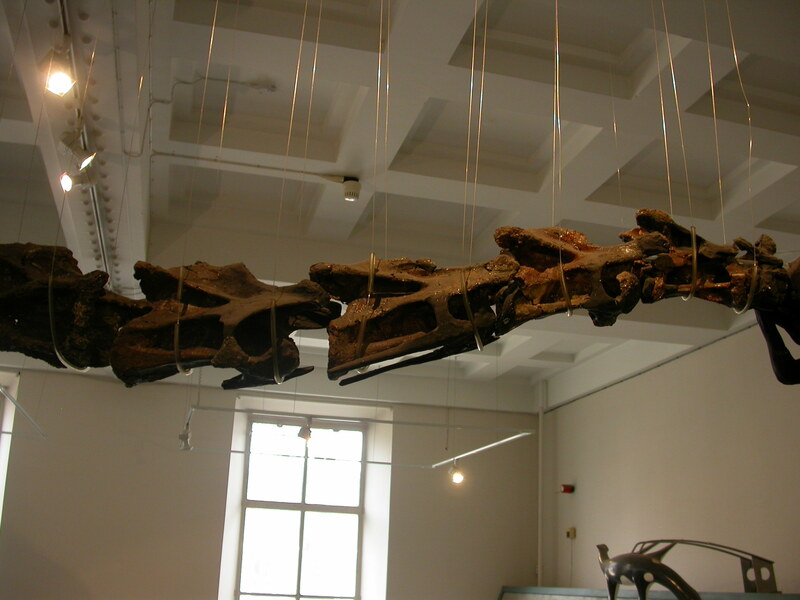 so even the actual Diplodocus carnegii cervicals on display (not casts) are partly plaster? Truly shocking. I also had a hunch the neck was not in articulated position…. Hatcher’s paper seems to confirm that. Thanks for the info Mike. Something’s bound to go wrong when a model’s designed based on “injured” vertebrae. Good to see detailed discussion. But I am struck that there is here no discussion (maybe kept for elsewhere?) re articular cartilage and intervertebral discs, further spacing out the vertebrae. I reckon that accurately estimating thicknesses of these surely is critical for correct spacing of the vertebrae near their life positions, and I wonder what information may be available for positing these soft-tissue dimensions.